Carlin peas (cajanus cajanwas) are a traditional northern food eaten during lent on Passion Sunday, the Sunday before Palm Sunday. Carlin Peas are a small, hard brown pea known by many other names, such as; Maple Peas, Pigeon Peas, Brown Peas and Black or Grey Badgers and were first recorded during Elizabethan times. It is likely that they originated from the Monastic gardens of the Middle Ages and for a long time, have been used to feed pigeons. The eating of Carlin peas during the period of Lent bears no religious significance but instead, seems to be linked to the civil war of 1644, where the Royalist Newcastle was under siege from the Scots. The lack of food meant that the people on both sides of the Tyne were dying of starvation. Legend has it that a French ship managed to dock at Newcastle with a cargo of Maple Peas. Other tales, tell of a ship, laden with peas, which became stranded at South Shields a fortnight before Easter Day. The peas were washed ashore and salvaged by the locals. The real story is lost in time but for centuries, Passion Sunday (the fifth Sunday of Lent), in some Northern regions of England, became known “Carlin Sunday” and the small brown peas became popular at this time. Although it would appear that the folklore is strongest in the North East, the tradition of eating Carlin peas at this time has spread to other areas of Northern England, Yorkshire and Lancashire. There is a Northern saying; “Tid, Mid, Miseray, Carlin, Palm, Pace-Egg Day”, which helps people remember the order in which the days fall. The saying is derived from the psalms, hymns and Sundays of the Christian religious period of Lent. Mid – The third Sunday when the Mi Deus Hymn was sung. Miseray – the fourth Lenten Sunday, was when the Miserere Mei Psalm was chanted. Carlin – Passion Sunday, the fifth Sunday in Lent, adopted by the North Eastern regions as Carlin Sunday. Palm – Palm Sunday, the sixth and final Sunday of lent. 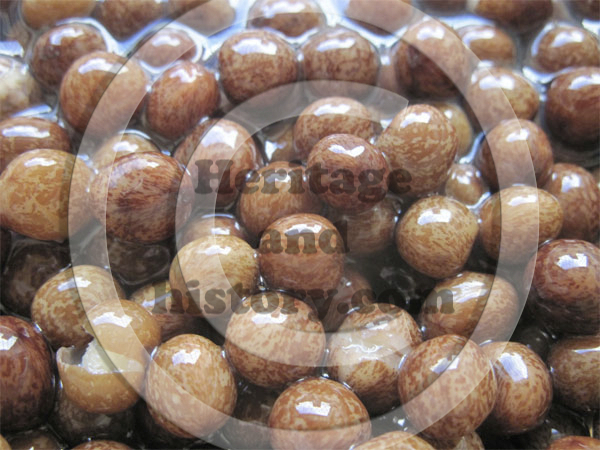 Carlin peas are now classed as a heritage or heirloom variety, often referred to as the medieval mushy pea. The peas can be grown in the same way as Sweet Peas. They will grow to about six feet high, bearing attractive white and purple flowers. The seed pods are filled with small brown peas which can be used fresh, or dried for winter use. Around the Northern regions and especially in the North east of England, a number of methods of cooking and eating these small peas exist. These vary greatly from just soaking the peas overnight, then after rinsing, boiling until tender. They can then be served hot as an accompanying vegetable, or fried in butter, adding brown sugar and sometimes Rum. They can also be eaten cold with salt, pepper and vinegar. Salt should never be added during cooking as this actually stops the cooking process. If you have any traditional family recipes or modern recipes for Carlin Peas, then please let us know. You can send them to us via the comments section at the bottom of this post.